Sunshine Kelly | Beauty . Fashion . Lifestyle . Travel . Fitness: klia2 – What’s In Your Bag? Do you believe in the power of imagination? I have good news for you, especially to all my shopaholic friends and followers I am sure you are going to scream. Imagine if you are given RM5000 what would you want to buy? Yes! You get to pick and choose the anything that you desired; What’s In Your Bag? will become a reality because klia2 will grant your wish. Imagine a contest with more than RM100,000 to be won. OMG! I want to win the klia2 shopping spree. How about you? What are you waiting for? This could be your chance to win RM5,000 shopping at klia2. 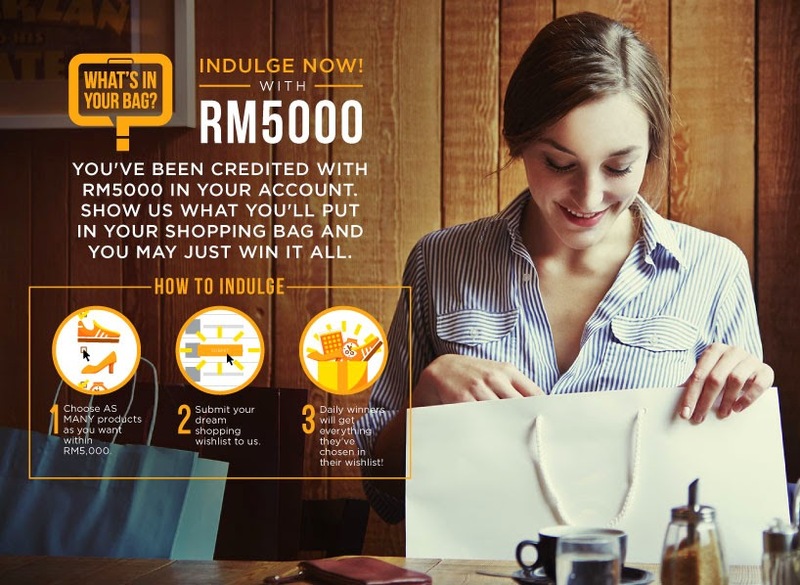 Everyone is given RM5,000 to shop at http://whatsinyourbag.my/en/. Wootz not only that! if you participate in the klia2 - What’s In Your Bag? contest you are automatic be in the running to be one of the Ultimate Lucky winner to win RM25,000 shopping spree on the launching day of klia2 too! OMG! Scream me me me please… Hurry ok, the contest is until the 23rd June 2014 there no participating fees or purchase require. You might be the lucky winner! Hope your dream come true and all the best! klia2 - What’s In Your Bag? 2. There will be a pop up informing that you stand a chance to win products that you have shopped with a given RM5,000 budget. 3. Go to the main page, browse the retail outlets and check out klia2’s offering online. 4. 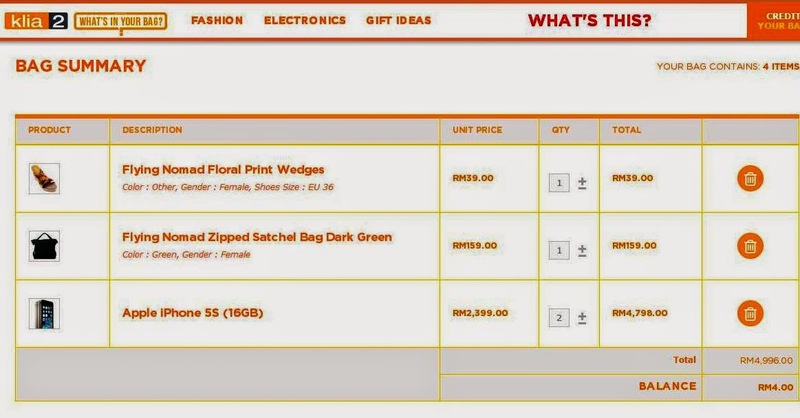 Choose the items that you wish for and then click “add to cart” until you hit your budget of RM5,000. 5. Once you are satisfied and selected all the items that you wish for with RM5,000 then you can proceed to check-out. 6. Upon successful completion of checkout, you are automatically entered into a lucky draw with everything that you have purchased. 7. On the day of the launch, a lucky winner will be announced to win RM25,000 shopping spree at klia2. The winner will only be announced on the launch, the actual shopping spree will not take place on the same day. Please take note that anyone above 18 years of age, from anywhere will be eligible to participate. However, prize redemption will only be available locally, from klia2 itself. The giveaway starts from 9th June to 23rd June 2014. How many of you have been to klia2? If yes, I am sure you are impressed with the new concept, spaciousness and not forgetting your shopping and gastronomy experiences. Currently there are more than 92 retails and F&B outlets plus there will be more outlets coming up soon. Shop till you drop! I am sure everyone will have a wonderful time at klia2 and looking forward to shop those duty free items. Sound great!! Been to KLIA2 early this month. Nice and spacious.